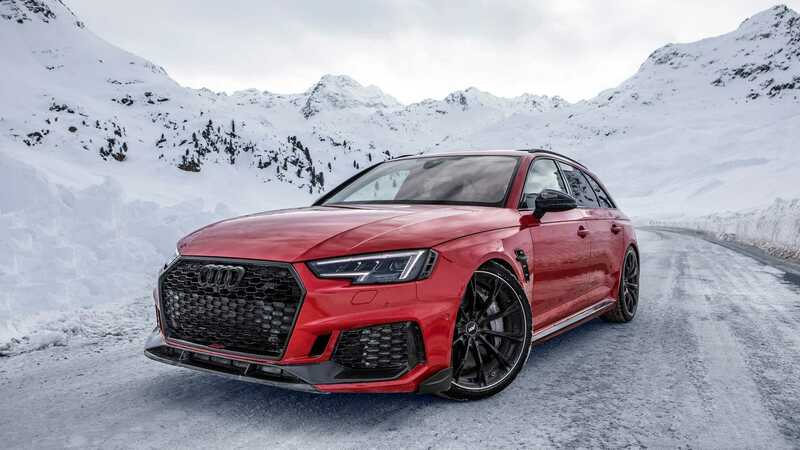 ABT Sportsline has released several photos and a video showcasing its limited-issue Audi RS4+ Avant having a great day off somewhere in the snowy Alps. The car will be displayed at the Geneva Motor Show in Switzerland in March 2019 and go on sale shortly thereafter limited to only 50 copies. According to ABT, the Geneva vehicle will wear a vivid Viper Green paintjob, while the one you can see on the photos and the video is a gorgeous Misano Red. The limited series is based on the Audi RS4 wagon/estate that ships with a 2.9-liter engine boosted to deliver 503 hp (375 kW). If this still isn’t enough for you, ABT Sportsline will tune the drivetrain a bit further for 523 hp (390 kW). Regardless of your choice, the car ships with an eight-speed automatic transmission and Audi Quattro AWD.